Ideal pH is 7.0 to 8.0. This product will raise the pH of acidic water (below 7.0). 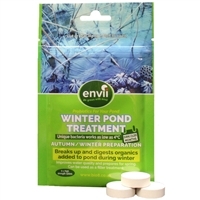 Envii Pond Klear is the best product for cleaning pond algae as it removes the organics that cause green pond water! Its natural biological action includes unique, patent-pending strains that work as low as 4°C. Using naturally occurring bacteria rather than harmful chemicals to tackle the cause of green water, Envii Pond Klear binds the suspended solids in the pond water and sinks them to the bottom of the pond for the bacteria to digest. Regular use of Pond Klear also helps to prevent blanket weed by removing the excess nutrients required by blanket weed (phosphorus and nitrogen) to grow, keeping your pond water clear, all year. Perfect for Koi carp and other fish ponds, Practical Fishkeeping said Envii Pond Klear could “change the face of pondkeeping” in a recent review. Envii Pond Klear targets the excess organics to improve water clarity and water quality, improving fish health and the ability to see your fish. Supplied in a 1 litre bottle with its own simple to use dose chamber you add 25ml per 1,000 litre/250 gallons of pond water. If the pond is needing a quick clean up use Pond Klear Xtra. Envii Sludge Klear is a pond sludge remover that specifically targets the sludge that builds up in ponds. The super-active bacteria breaks down the sludge that sticks to your pond by digesting and loosening it to enable the filter to catch it. Ideal as a bacterial starter for filters or to enhance the bacterial activity in your filter, just add the amount of tablets required based on your pond size! Sludge Klear also helps prevent and breakdown blanket weed by removing the key nutrients that blanket weed need to survive and thrive .....Nitrates and Phosphorous. Targeting these nutrients means that blanketweed struggles to survive and grow and also their anchor point to the sides or base of your pond is broken by the bacteria. 1 tablet treats 5,000 litres or 1,250 gallons of water, but we recommend a double or triple initial dose to really get the bacterial colonies active and starting to dominate the system with GOOD bacteria! Sludge Klear works as low as 4°C which allows for treatment in winter to reduce the effect of green water in spring. With 100 billion bacteria per tablet, Sludge Klear can be used to solve sludge problems or as a regular treatment for protection. Treat all year to return your pond to perfect health. Give that sludge a nudge. Envii Nitrate Klear is a pond nitrate remover that specifically targets the nitrates in your pond. Its task-specific bacterial strains capture and digest nitrates that can cause fish diseases like brown-blood disease. By removing nitrates from your pond system you not only help protect against disease but also against issues like blanketweed which needs nitrates as a nutrient to grow and thrive. Nitrate Klear is a not a specific cure for Blanket weed, but can be used in conjunction with Pond Klear, Pond Klear Xtra and Sludge Klear to tackle blanket weed effectively. The specific nitrate reducing strains are only effective when the water temperature is above 8°C which means you should only treat when the temperature is above 8-10°C. With over 100 billion bacteria per tablet, Envii Nitrate Klear is the simple way to deal with nitrates in your pond. Winter is a time when people usually turn off their pumps, stop feeding their fish, stop adding pond bacteria and forget about their ponds until the spring. We retreat inside to the warmth, indulge on food and drink and forget about the pond that we cared for so dearly, only two months ago. Whilst this seems like the logically thing to do, as not much happens in the pond over winter, it also makes your job a lot harder come spring. Debris begins to build up in the pond and begins to break down, leaching out organics and algae spores in to the water. These algae spores lay dormant until the temperatures rise above 8°C, where upon they have the perfect conditions to explode in growth. They have warmth, a food source from the deposited debris and most importantly no bacteria to fight with. Winter Pond Treatment contains large amounts of our innovative bacteria that are capable of working as well at 4°C as they would at 14°C to digest the algae spores and unwanted organics that enter your pond during winter. Unlike other winter pond bacteria, our bacteria are strong at 4°C and will work below this, down towards 0°C to ensure you don’t suffer from an algae bloom or green water in spring. By using winter pond bacteria in conjunction with a good winter preperation program, you can still turn off your pump, forget about your pond and indulge on food and drink, knowing that someone, or something, is taking care of the problem. Winter Pond Treatment contains no chemicals and is safe for all fish, wildlife and filters. Ensure that pH level is between 7.5 & 8.5 and KH level is above 5 before using any bacterial treatment to get the most from the treatment. When winter has passed, consider using Pond Klear to maintain pond health and keep green water at bay. Bacteria are a living organism and like any living organism, they only have a certain lifespan. Once this lifespan has been reached, they die and need to be replaced, so it is important to add bacteria in to your pond all year round. A top level Filter start by Oase. Contains 450ml nutrient solution and 50ml bacteria concentrate. Mix together and the fresh filter start is ready to use in 20mins. Dechlorinator with mucous membrane protection. Makes tap water safe by immediately binding chlorine and toxic heavy metals. Ideal after the use of medication or when topping up from the tap. 2 dose treatment for 12,500l (2,750gal). Maintains a healthy pond environment by controlling unwanted parasites and worms. A natural bacterial product which prevents the growth of duckweed by modifying the water chemistry and creating conditions which prevent the spread of this problematic floating plant. Envii Pond Klear Xtra is a pond treatment with all the features of standard Pond Klear but triple the strength. Like the standard Pond Klear, the Xtra version gives you 3 x the strength in the same size bottle and at only £27.99 this means you get the equivalent of one bottle for free! Developed to tackle badly affected ponds or small ponds with lots of fish, the extra strength provides much greater biological activity to clean the water and maintain a healthy, clear environment. Pond Klear Xtra is especially recommended to use at the start of the season in Spring where you need to add lots of bacteria to deal with the organics added to your pond over winter, then you can move to standard Pond Klear for maintenance. For the first use in Spring we recommend a double or triple initial dose to start the bacterial colonies quickly and make a good impact on the dirty water. Then treat 25ml per 1000 litres/250 gallons. REMEMBER TO CLEAN OUT YOUR FILTERS PRIOR TO USING AND WATCH YOUR FILTERS LIKE A HAWK AS POND KLEAR XTRA WILL REMOVE THE DIRT FROM YOUR POND QUICKLY AND YOUR FILTERS WILL NEED TO BE CLEANED REGULARLY! Like Pond Klear it works as low as 4°C for all year round treatment. When it’s really green, let the fish be seen!